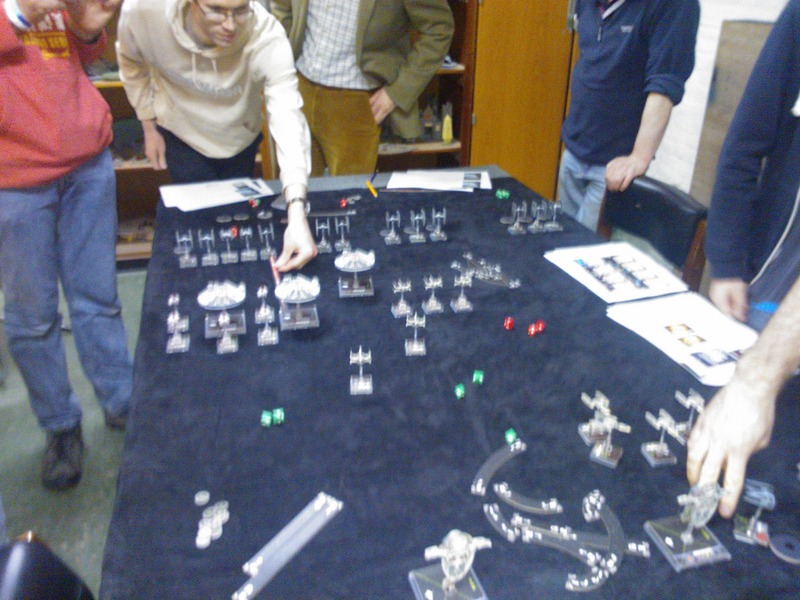 So to get people involved in some X Wing my non local old Club decided we should pool all our miniatures and have one massive game. The idea being to get the YT 1300s off the board from one end to the other. The pics are a bit fuzzy my phone dislikes low light levels! 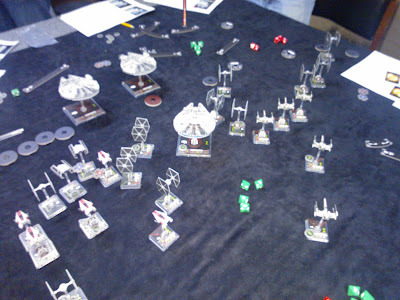 The imperials can have endless TIE reinforcements. 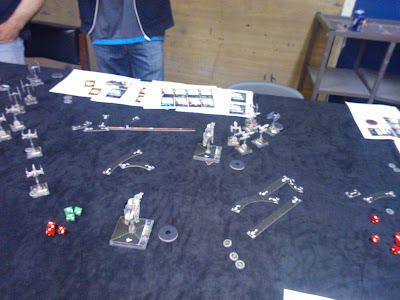 Now we had 4 players a side and only a few of us had played before so it was a slow game. 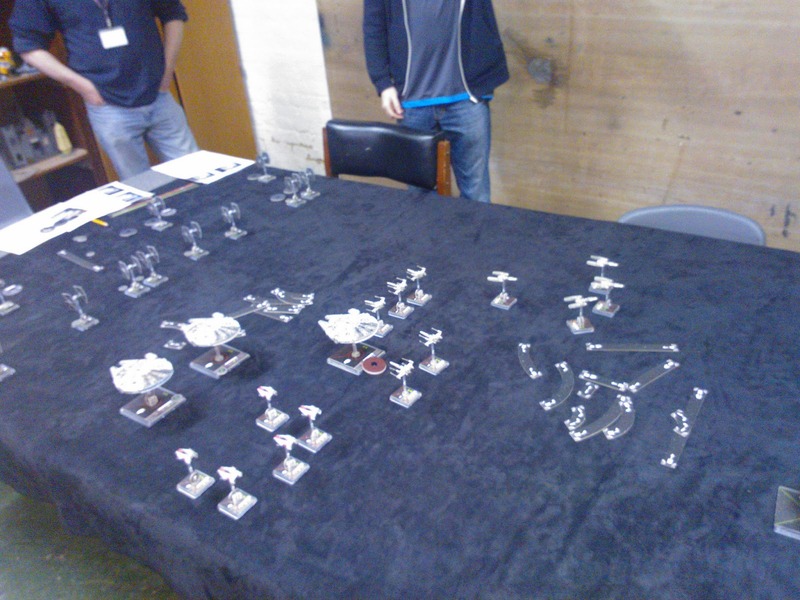 Also as those of you who have played before may notice the YT 1300s are really a bit close to the end of the table, so it is not going to take long to get off. But you live and learn! This is just a run down of how it unfolded as it was too big to go into detail ( I can't remember it all). This is the stand off before the storm. 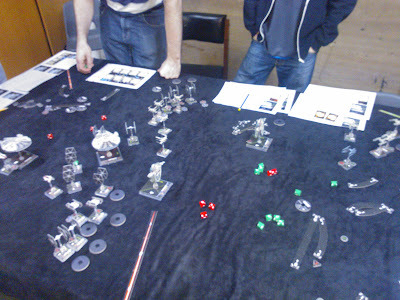 The Ys are facing off against the Interceptors just out of shot, with a couple of Firesprays. 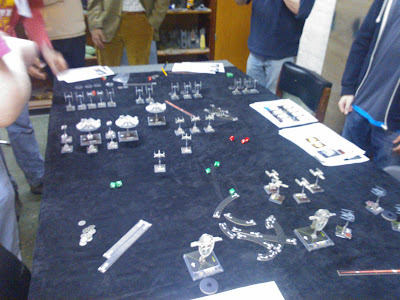 With the left flank A wings ploughing straight into the Tie Fighters. Darth gets a face full of cluster missiles from the As but survives. All the ties try to shoot the YTs but fail to do any serous damage. 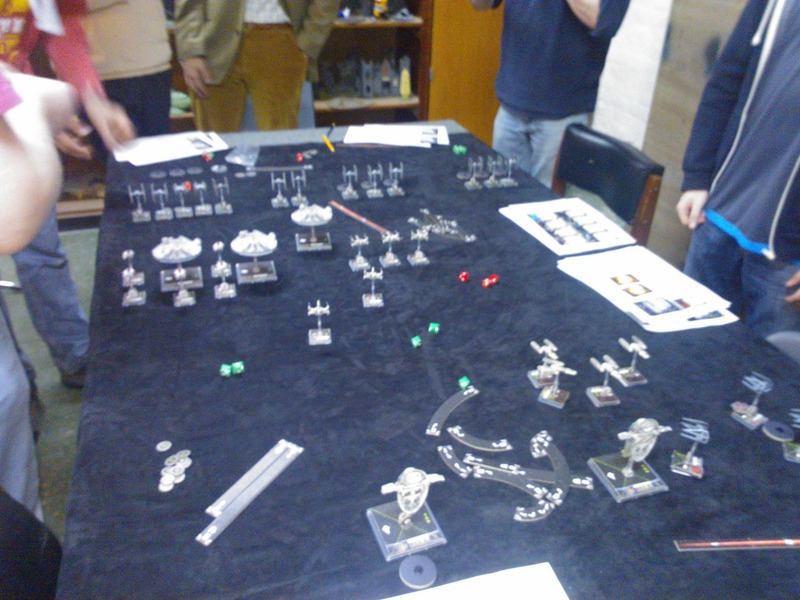 In the centre the X Wings, bravely led by Luke at the back, attempt to take down some Ties and yet again the die are poor both ways. However the rebels get 2 extra victory points as Han solo in the millenium Falcon take the first shot so Han Shot First. The Ys continue to ionise the Interceptors and take a huge amount of punishment in return. But the flying bus keeps on going. The Transports make a break for it as all the Ties and Ys on the left do some koigerans (?) and ineffectually shoot at each other whilst the Xs finally take some Ties down and the Ys take out an Interceptor.The Millenium Falcon escapes off the board too. The end as the rest of the transports escape. And it is getting late so we finish there. 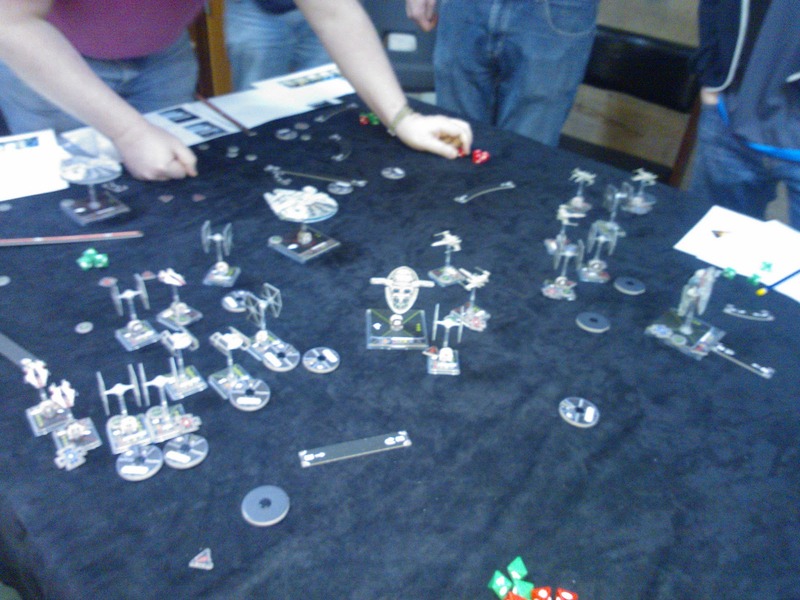 Big X Wing games take time, especially with novices like we are. It was a load of laughs and great fun. However it did get very messy with tokens all over the place, movement dials getting mixed up and people forgetting all manner of things. Next time I think we will tone it down a little and have smaller more vanilla squadrons. 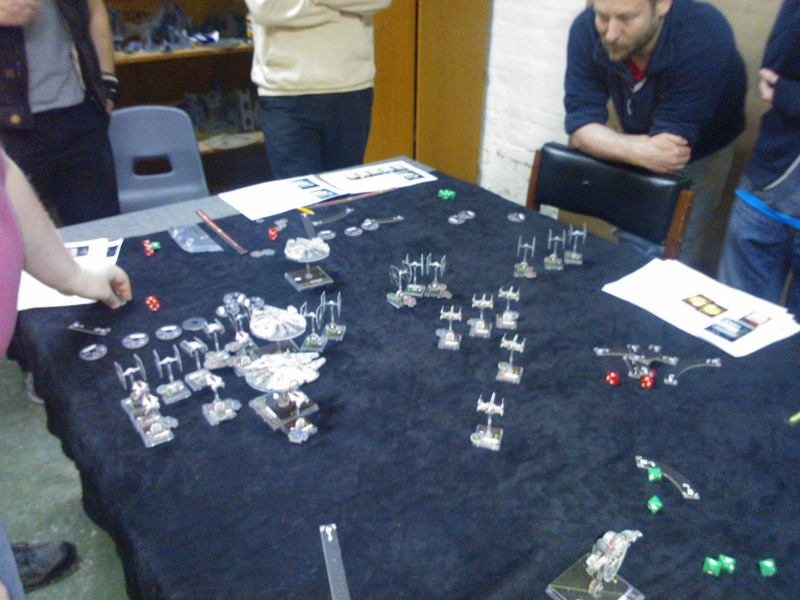 However big thanks go to Steve who put a lot of effort into the scenario and photocopying all the cards so they did not get all mixed up and each ship had its own reference sheet. Thanks!